Saying hello from New York City. Things that you think is boring could be exciting to those on the other side of the globe, so it's not boring at all. I also like shopping and collecting stuff. And I don't like to wear heels either. I just don't know how other ladies walk in them. great give aways. Isn't this fun. I'm enjoying my tour through blogland.I am so excited to participate in my first OWOH blog tour . Your creativity is lovely. I hope I am lucky enough to win. The shirts would be too small for me, but I would ADORE that journal! No heels here...lol too big for your pretty blouses. You have a great blog ..Please visit mine and you'll be entered in my draw. Hello from California!! Please add em to your list, I love the book and charm! Greetings from Northern Virginia,USA. I'd love a chance at your prizes! Thanks. Very nice, Diane! And don't stop writing! Happy OWOH to you! Stop by for a visit if you get the chance--I'm flying along with you. Greetings from Cornwall, great prizes, I love the charm! pop over to me for a visit if you find time! I'm travelling around the world thanks to OWOH. What lovely giveaways! Please no blouses as I am an extra large size! The notebook and key chain are very nice. I am #123 in the OWOH event. Glad you joined us! Lovely prices! So please count me in. Hello from MI, USA! Sweet giveaway. Hope you are having fun with the OWOH event! Come visit the UK if you have time #630 on the list! Thanks for inviting me to your blog. This is my first OWOH and it's been quite a trip. If you have time please wander over to my blog. Nice to meet you. wow! thanks for a lovely giveaway! Hello from Idaho! Thank you for being apart of the OWOH tour around the world! hi Dianne!!! hugs from a fellow Filipina!!! so glad you get a chance to join OWOH on its final year!!! Hi there, love your prizes. The blouses wouldn't fit me but I love notebook. Please call in on me at #100 if you have a chance. Please include me in your doorprize giveaway. The notebook/journal with key is so unusual. I love the idea that the heart lock actually works. Great choice for a door prize. My grandaughter would love the blouses. Thanks so much for entering OWOH-it's so much fun isn't it? Please come over to check out my blog as well at number 92 where a face clay planter awaits. I'm just stopping by your blog because the title jumped out at me from the main OWOH site! :) Your blog is so homey! Thanks for inviting us in. I'd love a chance at your door prizes! oh, and thanks for giving a resource for random number generators.. I had no idea of what to do for that. :) So thank you!! Well thank you very, very much. It is so very nice to meet you! I hope you will visit my blog, too! wow, that's really nice, i so love them. Please enter me too. Hello! It's good to meet you. I'm participating in OWOH for the first time & enjoying visiting people's blogs from all round the world. What a talented bunch of people we are! Thank you for sharing your blog, & I hope you'll come & see me at http://dormouse.wibsite.com/2011/02/02/one-world-one-heart-2011/ I'm N° 688 on the list. Thanks for offering such lovely prizes. Thanks for the giveaway, I love the notebook and especially the clothes! It's would've been really cool if the key could open the notebook too! Nice giveaways! Count me in! I love the key to my heart key ring! Those shirts are my size! How cool! Keep doing what you love. Love is contagious. what a generous giveaway! How exciting. Actually I welcomed the first paragraph of this post. Nice to read some more about you! I'm planning a giveaway soon too (unrelated to OWOH)...stay tuned. Hi, and thank you for entering my OWOH giveaway (831). I really like the notebook and bag charm, they are gorgeous. Please enter me in your draw. Pleased to meet you Diane! What wonderful gifts you are giving away - and what a great life you have! Please read about me too - Blog #594 on OHOW! And enter me in your drawing too! Thanks for participating in OWOH. Please enter me in the drawing for your awesome gifts - love that notebook and charm. I’ve enjoyed looking through your blog and your work is wonderful! Stop by and visit mine for a chance to win my door prize. In the meantime, I hope this journey is as fun for you as it is for me. Hi Diane! Hello from Thailand! I'm glad to see another Kababayan here..:) Oh, I would love to win your give away.. but I hope I can fit in the blouses too...but I guess that'll be a motivation to lose weight..
Hi Diane, What a lovely giveaway! Hope you can come and visit me at MDW's Love (#548). Having a great time blog hopping. Nice to meet a fellow Filipina and keep in touch. Would love to win any of your lovely prizes! I am always on the lookout for a new notebook~! Greetings from the mountains in western North Carolina. You have an awesome blog and giveaway. 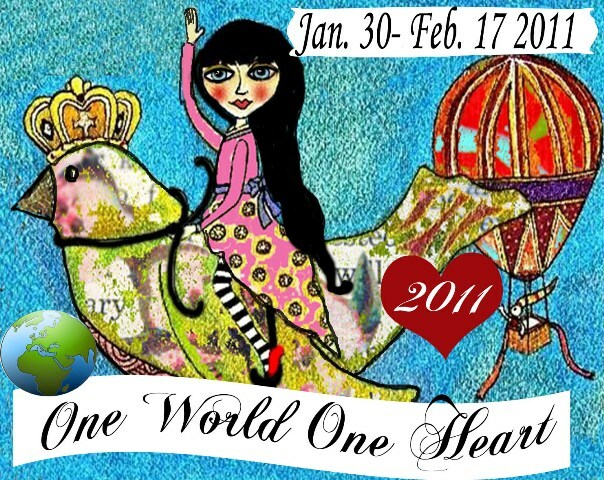 I am having so much fun checking out OWOH participant's blogs. Hi Diane! What great prizes! I hope you have a great time with OWOH this year! What a cool giveaway! Thanks for entering me.